The Oil Painting Course You've Always Wanted comes highly recommended and praised by its readers. Kathleen Staiger is an artist and teacher who graduated from Hofstra University in New York with a bachelor's degree in art education and a master's degree in arts and humanities. 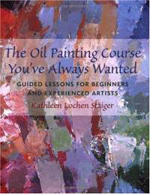 (To find out more about the author, Kathleen Staiger and to see examples of her art, see her website, KathleenStaiger.com). Staiger has produced this book with the beginner and advanced student in mind. It caters to both because of the special techniques she teaches to get to know your colours and understand the medium of oil, which can be a tricky medium. Here you know you are in good hands and getting quality instruction. To begin, Staiger covers the topic of getting your supplies together. She advises purchasing the best quality materials that you can afford but recommends some cheaper alternatives suitable for learning purposes. Kitting up for a new hobby can be very expensive and might make you nervous when starting out, so this is a very helpful approach. The supplies covered are paints, brushes, supports, easels, mediums (for thickening) and cleaners, palettes and accessories. She goes into some detail as to which brands of supplies and which colors of paint are best for the beginner and the size of canvas to get. The book is written like a class instruction manual and so you feel supported throughout the learning experience which has been carefully crafted for its teaching effectiveness. After the art supply shopping is done, the next step is to tackle the topic of bringing the third dimension onto the two dimensional canvas through what is essentially an optical illusion. But don't worry - it was invented in the Renaissance! Brush control is taught by practising drawing, shading and painting a simple sphere. Perhaps the trickiest part of oil painting is mixing colours and getting the appropriate texture. Staiger tackles this in detail, and there is even a whole page on "Taming Thalo Green" which is a translucent colour opposite magenta in the color wheel. Her approach to color is an organised system of color mixing which makes it easy to understand and provides a grounding for advancement whatever you go on to paint. Then there is a chapter on "putting it all together" i.e. the drawing, perspective, brush technique and color. The final three chapters are based on the genres of landscape, portraiture and still life. This book is illustrated with clear diagrams and text making it easy to use. The structured step-by-step approach helps you to progress while learning and practising new skills. Because it focuses on oil painting, the book is not only a good beginner's guide but also goes into enough depth for use as a reference book in oil technique. Whilst some of the other products in this category cover painting and drawing in a more generalised way, The Oil Painting Course You've Always Wanted is a great guide for this adventurous medium, and will bring your hours of rewarding improvement in oil painting. At just $16.47 from Amazon.com, this is great value for money, and if you don't have time for evening classes is the perfect solution. So get those brushes out!